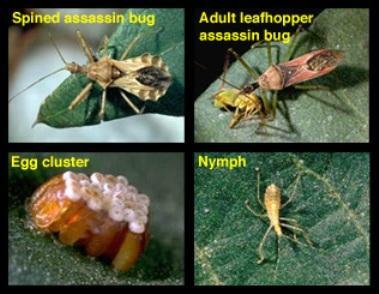 Life cycle: Various species of this bug have different life cycles. There are usually only one generation produced each year. Some species take several years to complete their cycle. Some bugs hibernate as adults or nymphs, while others overwinters as eggs. Physical Description: This 1/2 inch long, bugs are brown or black with a flat, sculptured body and a groove for hold its beak when resting. Its abdomen may flare outward and often has a peculiar hood or structure behind its head. The nymphs are quite often brightly colored and the eggs are usually laid in the soil. Feeding characteristics: These Bugs, adults and nymphs are voracious predators in the garden, attacking Caterpillars, aphids, Mexican bean beetles, Colorado potato beetles, leafhoppers, Japanese beetles, an occasional honeybee, and even gardeners fingers. The bite is painful at first and then itchy. Occasionally, some people may have an allergic reaction to the substance these bugs inject through their curved beaks. Controls: Controls are not necessary.